You are back! Good. 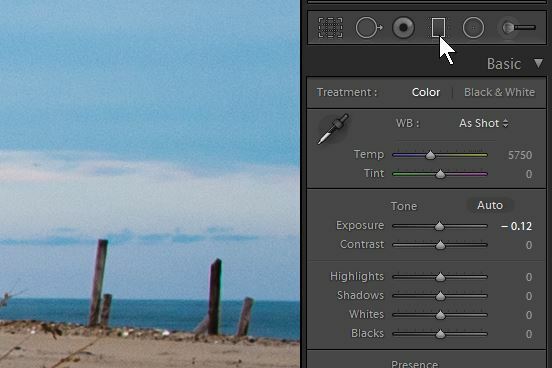 In the last article we talked about White Balance and Noise Reduction. As two of the five most useful tools in the arsenal of the night photographer. Healing and cloning will be in Part 3. While we have seem some fascinating composite and highly edited images our goal is usually to make a compelling photo. But we do like realism, too. So while we will show techniques that can be pushed to extremes to make gaudy Milky Ways, or super saturated star trails, we personally do not go there often. Below is the result we want to achieve. Single Exposure with exposure and contrast adjustments, healing, cloning, selective blurring and sharpening. Which one is the best image to start with to make our adjustments? Hint, it’s the one at the right. The +1 exposure has no loss of detail because nothing has been over exposed. Here is the exposure. 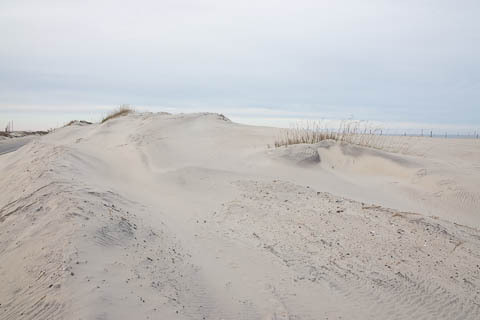 The scene seems flat and lifeless – almost nothing like it looked to the eye, and not close to what we hope it will be. Part of the reason it looks so flat is that we have not done any adjustments to the original RAW file. If you shoot JPGs the curves and saturation adjustments are automatically applied so you might conclude that RAW images are a waste of time. That would be wrong. The truth is there is much room for improvement in the RAW images and much of the “good stuff” is lost when the camera applies the conversion to JPEG. All of the histograms show decently exposed images. But it looks like even in the +1 image we still have some room left. That is, we could have exposed a bit more to get the whites all the way to the right. All of our histograms show that we have no black (nothing at the left edge), and no white (content at the right edge). An underexposed image might have richer color but it will suffer when we boost the exposure and contrast. The lighter exposure will suffer much less degradation. In fact, the act of reducing exposure deepens the saturation – we do not have to play with the saturation sliders at all! Pleasing saturation shifts from adjusting exposure are one of the many good reasons why exposing to the right (ETTR) is an effective strategy. There are many ways to adjust contrast and surprisingly the “Contrast” slider is not usually the most effective way. Using contrast alone often makes the lights too light and the darks too dark. One thing you can try is to use the “Auto” button. It sometimes works. In fact, for these images, it works pretty well with the +1 exposure, but not as well with the normal exposure. The histogram has been stretched and the image looks pretty good. Note that we’ve turned on the clipping indicators by clicking where the white arrows point. After Auto we found a few small spots where black level clipping has occurred as indicated by blue blobs which are circled in red above. No big deal. You can also see what Basic adjustments Lightroom made – exposure has been reduced by one stop, contrast +20, whites +62, blacks -50. We now have an idea what the Basic adjustments can do. Auto almost never creates a good result when working with dark or night images. There is another way, and in our opinion, a more powerful way to adjust the exposure and contrast and that is using the Tone Curve. 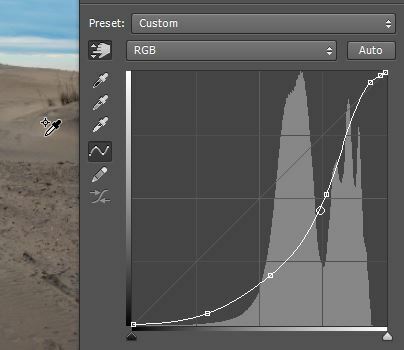 One reason we prefer this method is that it has an almost exact analog in Photoshop (Curves), as well as an almost identical behavior if using Adobe Camera RAW. What we want to do is to darken the shadows and midtones and slightly lighten the bright areas without losing information – that is to adjust the exposure and contrast. The process is called “stretching the histogram”. It’s pretty straight forward. 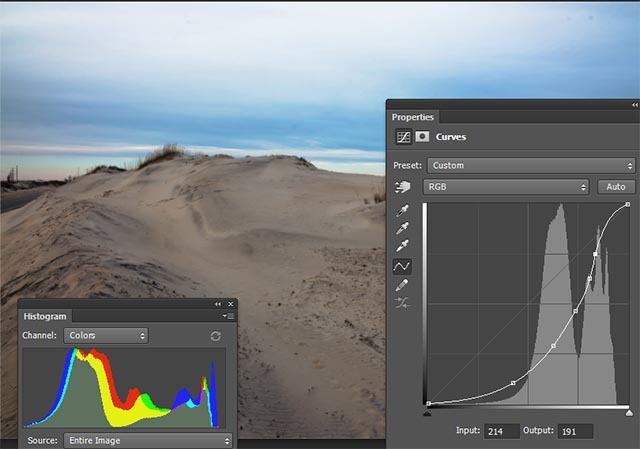 Click points on the curve and drag up or down and left or right to create a new curve while paying attention to both the image and the resulting histogram. Can you make these adjustments using Adobe Camera RAW? Yes! The controls are nearly identical. This is now a good starting point to apply some additional pop, But what if you wanted to do this in Photoshop? 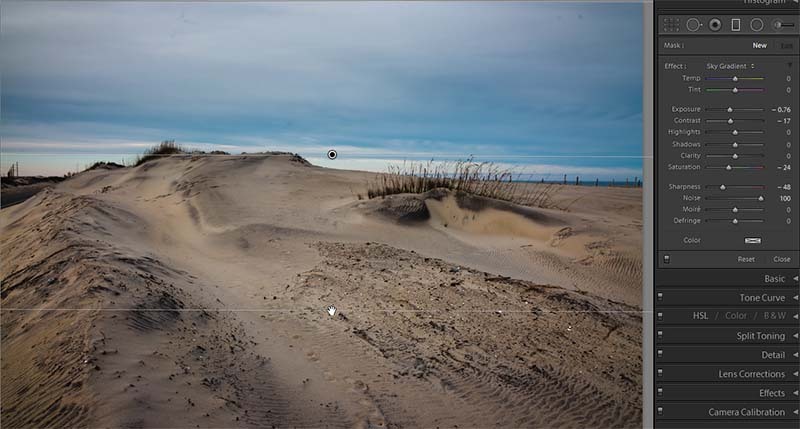 The image above has brought out a bit of pink in the sky, but the dune is a little flat and a little dark. The good news is there is a way to give specific colors special attention – using what we call the “twiddle finger”. You click the hand icon, then pick an area of the image you would like to brighten or darken. The luminosity selected is shown on the graph, then you drag the mouse up or down. The twiddling can be repeated. Beware, though, twiddling is global, not local. 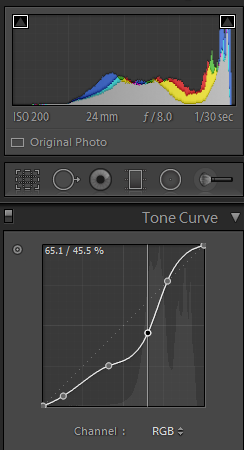 In general the tone curve should always be flat or upward as you move left to right otherwise you will be lightening dark areas to the point where they become lighter than adjacent light areas. One way to improve your curve is to smooth the graph. Click the pencil icon then the icon below it (graph adjust), then click the graph (above the pencil). After a bit more fiddling and twiddling we get what you see below. What more fiddling? Well, we like to add another adjustment curve and select the “Increased Contrast” option. If things were close to good to start with, the curve might go too far, so adjusting the layer opacity downward is the solution. In fact, we use the “Adjust contrast curve” so often that we created an action for it and assigned it its own hot key (F9). Now we have quite a bit more drama, and much more contrast. Where are the distractions? What leads your eye away from the interesting parts of the scene? What are the interesting parts of the scene? Now is a good time to make note of the distractions, because soon we will conquer those. In truth, we have one more thing to address in the exposure category. The sky is a bit too bright. The solution is to apply a gradient using either Adobe Camera RAW or Lightroom (it can be done in Photoshop but it is harder than it should be, and less convenient). The graduated filter (M) is our friend for not only darkening the sky, but also making other adjustments. That you can make multiple adjustments simultaneously is one thing that sets it apart from the Photoshop methods. 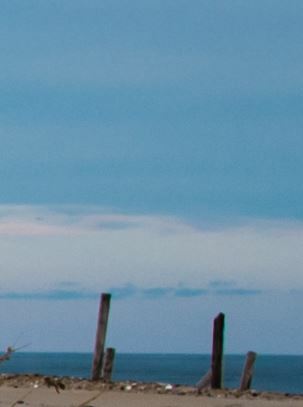 Here we have zoomed to 100% to show both a portion of the sky and the location of the graduated filter tool. Note that the sky is a bit “gritty”. We will fix that! Our sky fix will illustrate one of our other techniques: selective sharpening – only in this case we will de-sharpen to remove the “grit” as follows. We use a sky gradient so often that we created a pre-set for it. The preset reduces exposure by -0.76, contrast by -17, saturation by -24, sharpness by -40, and noise by +100. Those last two, decreasing sharpness and increasing noise processing result intentionally in blurring. In this case the exposure correction is a bit too strong, but that is easy to fix by bumping the exposure up a little (-0.51). Let’s look at what this gradient did to our sky. Notice how the grit is just about gone. If you are thinking that applying a gradient to darken the sky is somehow dishonest, then please don’t use a graduated neutral density filter (GND) which does the same thing at image capture time – but a physical GND does so less elegantly! We snuck in a trick to desharpen a mottled/gritty sky above, so please read that for one direction. In fact, we find that using noise reduction is often the most effective way to soften because the result – if not pushed to an extreme – is often more satisfying than using any other method. But some things need a little sharpening, like the eyes and hair of people, the boundaries between objects in a landscape. When we want to do sharpening we never (ok, almost never) do global sharpening. One reason we do not globally sharpen is it tends to make mottle things more mottled – like the gritty sky we showed earlier. It seldom makes sense to sharpen clouds or things that are not sharp by their nature. Indeed in our beach scene there is really nothing that demands sharpening, but all the same, we’ll apply a little bit at the sky/ground border – mostly to help the sea oats stand out a little more. 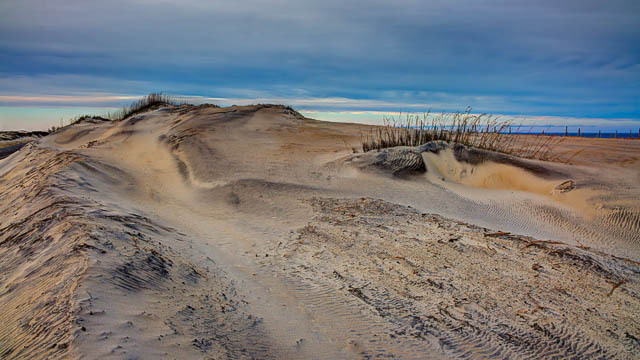 It’s tempting to think that the Lightroom adjustment brush “sharpen” tool is the right one to use here, but often sharpen alone is not as effective. When sharpening is overused it creates odd artifacts. Often the more effective way to sharpen is to use a bit of “clarity” as well as sharpening. Clarity is a local contrast adjustment which has no analog in Photoshop. 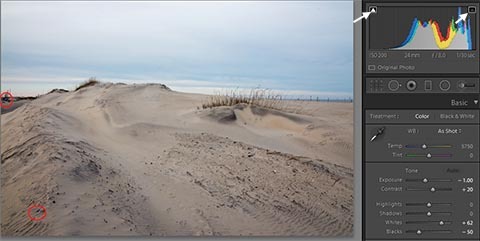 If you want to use clarity in Photoshop you must bounce over into Adobe Camera RAW. 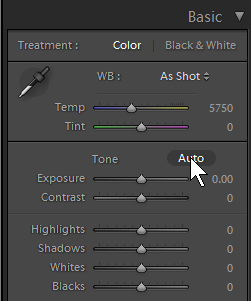 In Photoshop CC you can get a layer into ACR using the Filter -> Camera Raw Filter dialog. Lightroom and ACR are very similar, so lets show ACR here. After setting all the adjustments to zero (easy in Lightroom, just double click on each item), we set the Clarity up (+15), and the Sharpness up (+6). Adjust the size, feathering, density and flow of the brush and paint along the horizon and through the grasses. It’s always better to go a little at a time than to try to go all at once. When done hit apply or Open. In Photoshop we often take a completely different approach. Instead we duplicate the layer, label it “Sharpened” then sharpen (using the smart sharpen filter) or noise reduce the entire layer and then mask it all off. We then “paint back in” the areas we want a correction applied to using a white brush on the mask. Wow. We’ve spent quite a lot of time talking about exposure enhancements and sharpening and desharpening, so spot removal (cloning, healing and cropping) will appear in part 3. This entry was posted in Adobe Camera RAW, Creativity, Exposure and Contrast, Lightroom, Noise Reduction, Photo Processing, Photoshop, Sharpening and Softening, Workflow and tagged ACR, Adobe Camera Raw, brightness, contrast, curves, ETTR, Expose to the Right, exposure, Lightroom, Photoshop, tone map on February 17, 2014 by Steven Christenson. This is really full of great info! I think that it’s worth mentioning that over sharpening is one of the biggest mistakes made by modern photographers these days! So many muddy looking images by people being over liberal on all the sliders. Less is generally more!